After a refreshing rest in Selfoss, fully gassed up (never pass up the chance to get gas in Iceland - you never know where your next gas station will be outside of large towns) and packed in the car amidst the light early morning rain, I was off again on this great adventure. I decided to first tackle the "Golden Circle" of popular tourist attractions somewhat near Reykjavik. I headed North and started at Great Geysir & Strokkur Geysir and the hot mud pits in the surrounding field. Passing Kerio on my way - this 6,500 year old explosion crater was once the site of a Bjork concert with her floating in the ethereal green lake that now fills the crater. For $4 viewing fee - I drove right by it - Iceland has so many places to visit that are worth an hour or two of your day - you will run out of time unless you prioritize! Fairly unimpressed with the Geysir, having seem more interesting ones while on the Pacific Crest Trail in California, I lingered just a few minutes to get my token tourist photo and then sped off to the massive Gulfoss (see in the main photo above) and the dirt road heading into the interior - and snow capped peaks near Skalpanes and the home of the Mountaineers of Iceland. 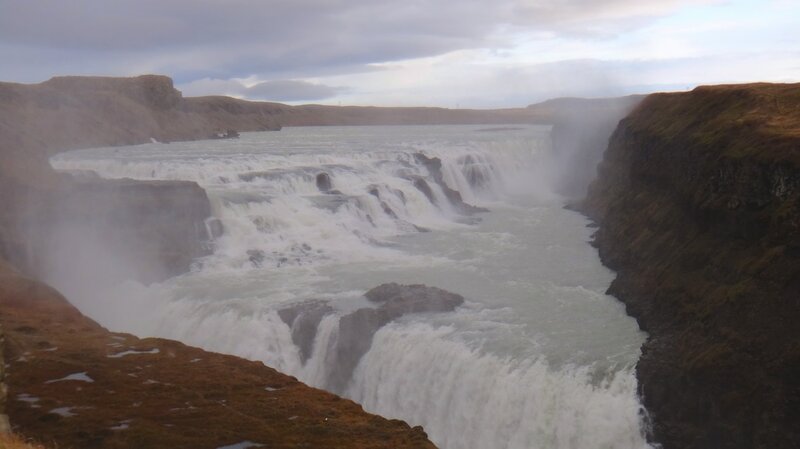 Gulfoss was on the scale of Niagara for impressiveness. Incredibly well tiered, this amazing falls was well worth the visit. While the lower viewing walkway was closed due to ice danger, I still enjoyed walking the top routes and taking in the massive power of this falls. After Gulfoss I had a snack, and used the bathroom. Nothing like getting up on a snowy mountain and needing to use the bathroom after just being parked next to one for an hour. I decided to flip the switch and turn on 4-wheel drive and start driving on F35, the snow and ice covered road heading North from Gulfoss and cutting across the country South to North and rejoining the Ring Road (route 1) near puffin and northern light territory in the far North. Driving quickly on this road in a Jeep was like trying to run in molasses. Neither one is going to happen quickly. With potholes the size of the car (I exaggerate only slightly) it was like Mountaineers trying to navigate a crevasse without a bridging ladder - and instead trying to use a car - tedious at best. I made it a whopping 1.5 hours into the road before I called it quits and decided to hike up Blafell a short 2,200ft hill next to the F336 road that leads to Skalpanes and one of the Mountaineers of Iceland base camps to get on the Langjokull Glacier. Knowing both that I had to turn around and drive back on this ridiculously slow and snow covered road, and that solo-hiking up icy hills in Iceland even with crampons, trekking poles, and an ice axe is not widely regarded as genius level intellect - I stopped short of the summit by about 100 meters and enjoyed taking pictures and soaking in the scenery all by myself. Returning back the way I came with the setting sun in the front window, and the red hue on the snowy mountains, I yearned to have a month to truly explore the incredible landscape in winter. Deciding to sleep in Rekjavik for the night, I briefly stopped by Thingvellir National Park and looked at some of the deep cracks in the landscape that gave an eerie sensation as the sun set and the night air gained a perceptible crispness to it. I photographed only one thing during the evening in Rekjavik - the iconic church. The rest of the evening was spent meeting new friends - drinking, and relaxing after yet another busy and fun day.